I was fortunate to have a clear morning on Nov 20th to setup the telescope a few blocks away from my apartment at Observatory Park in Denver, CO. Despite the light dome from the city and the still nearly full moon, I managed to capture some decent images of both C/2012 S1 ISON and C/2013 R1 Lovejoy. A dark sky site would have allowed for much more of the tails of both comets, but even in the city with a moderate telescope or binoculars, there comets are worth waking up early for. ISON will reach perihelion, grazing by the sun at a distance of less than the sun’s own diameter on November 28th! It is still anyone’s guess as to whether it will break apart, or become a brilliant naked-eye comet if it emerges again once past perihelion. See the Sky and Telescope ISON blog page for the latest, along with an observing chart. 12/7 Update: ISON disintegrated as it looped around the sun. There is no nucleus left, just a very diffuse dust cloud that continues to dissipate. A good telescope and seeing conditions are needed to view what remains. I observed ISON @ 5:50-5:54 AM, and would estimate it as magnitude 4-5; not naked eye visible at this location. The comet was viewed about 12° above the E horizon, just below and left of Spica, with Mercury below and left of the comet at about equal distance. This image is composed of 3 1-min subs taken with 1 min intervals between tracking on the comet. Canon T3i prime focus with 6″ F/9 1370mm Astro-Tech ritchey-chrétien astrograph plus Astro-Tech field flattener. Celestron CG-5 eq mount, and Orion Magnificient Mini Autoguider. Lovejoy is less talked about, but is actually easier to observe because it is so much higher in the morning sky away from the horizon. As of early December, Lovejoy is now visible (with binoculars) in the NW after sunset, and again in the NE about 2 hours before sunrise. It will reach perihelion on Christmas Day. 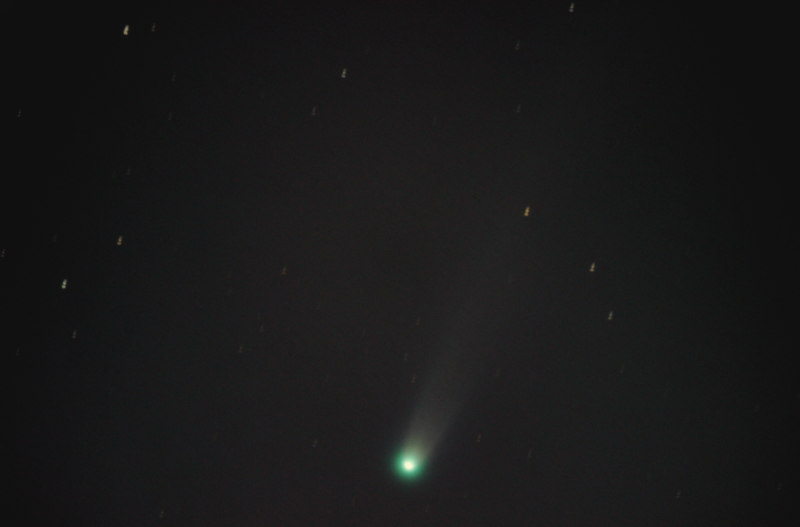 (ISON and Lovejoy are our holiday comets!) Unlike ISON, Lovejoy is not a sungrazer. It will be .8 AU (4/5ths the distance of the Earth’s orbit) from the sun, so it will loop back around. This also means it will probably remain a binocular comet, not a naked eye comet, unless you are under very dark skies. I observed Lovejoy @ 5:31-5:38 AM. Estimated magnitude 4-5; not naked eye visible at this location. Lovejoy was in Ursa Major, forming a right triangle with the comet in the 90° corner, and the stars Phecda in the big dipper and Cor Caroli in Canes Venatici forming the other corners. Alkaid at the end of the big dipper handle lies opposite the hypotenuse from the comet. Image composed of 7 1-min subs tracking on the comet. Canon T3i prime focus with 6″ F/9 1370mm Astro-Tech ritchey-chrétien astrograph plus Astro-Tech field flattener. Celestron CG-5 eq mount, and Orion Magnificient Mini Autoguider. 5 Responses to "Photographing Comets ISON and Lovejoy"
I couldn’t find LoveJoy in 10×70 Binocs this early AM either and it should have (was) high up in the sky at 5:45a.m. Tried capturing it with my DSLR too at 18mm & 55mm without success. All I managed was some bad photos of Arcturus, but this was my very 1st attempt at Astrophotography with it (Sony A55 SLT) . Moderate experience with older 35mm SLR’s. Glad I stumbled upon this site, some good articles here, I’ll be back. I hope you get out and try again for Lovejoy. If you have an iPhone, SkySafari is a great app to help pinpoint the location of comets and other objects. While I also like StarWalk, it isn’t accurate with comet positions. 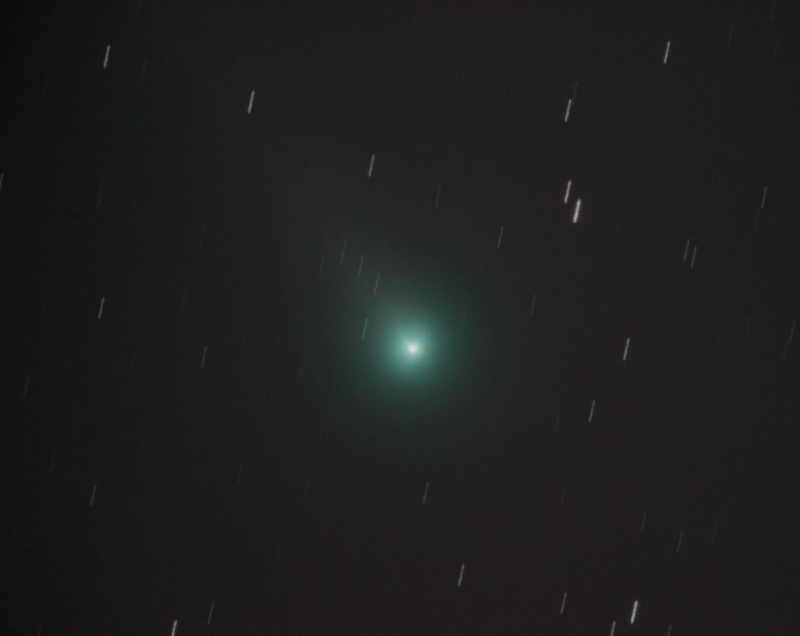 Lovejoy will probably be just visible with a 55mm lens and about a 10 second exposure at a high ISO. I really wish I could see these darned things. I keep trying but can’t seem to find them. Getting tired of getting up early only to waste my time staring up at nothing. How much longer will these comets be visible? Assuming ISON doesn’t evaporate next week of course . . .
ISON is going to get lower each morning as it approaches the sun. The morning of the 23rd, it will have a close conjunction with Saturn and Mercury, but will be less than 10° above the horizon before getting washed out in the dawn light. Lovejoy will be visible all through December, but it’s hard to say how it may or may not brighten or dim. That’s disappointing. No wonder I couldn’t find ISON. I don’t have a view of the horizon and 10 degrees is definitely not see-able from my apartment. But I haven’t given up! Maybe if the clouds part this weekend I’ll at least try to catch Lovejoy.